No, we aren’t joking and no, we aren’t overestimating ourselves. We are sure Easy Mail Merge has the most advanced Outlook mass email engine. This article will show you how Easy Mail Merge can create complex mass email scenarios, allowing you to personalize every aspect of your outgoing mass email. First of all, Easy Mail Merge is an Outlook add-in designed to compose, schedule & send mass personalized emails directly from Outlook. It works as an Outlook add-in and it’s available for any Outlook version starting with Outlook 2003 (Outlook 2013 being supported, too). 2. queue and schedule your mass emails so they are not sent all at once and your email account doesn’t get suspended by your provider. Being integrated with Outlook, Easy Mail Merge can quickly import Outlook Contacts, Outlook Distribution Lists or even Exchange address books or Exchange Global Lists. 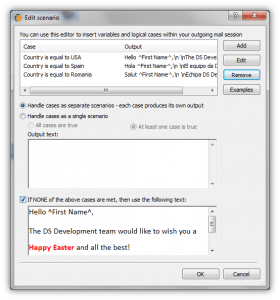 Obviously, it can also import mass email fields from the standard CSV file format. Not only that it imports the email addresses required for your mass email campaign, but it also imports all fields related to each email address. This way, you can use all these fields to automatically personalize the content of each mass email. 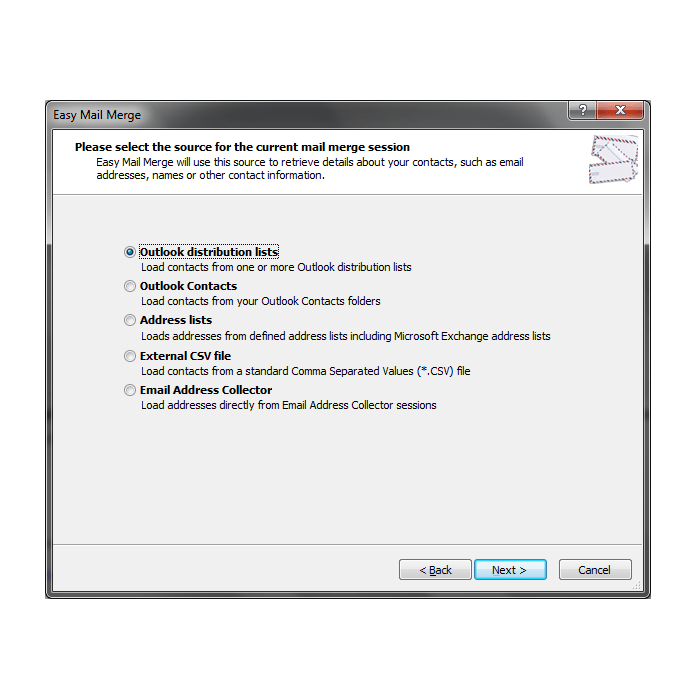 Being designed as an Outlook add-in, you can compose your mass emails directly using the already familiar Outlook interface. Unlike other mail merge applications, Easy Mail Merge doesn’t require you to learn a new email editor interface or to use Microsoft Word to create a mail merge task. 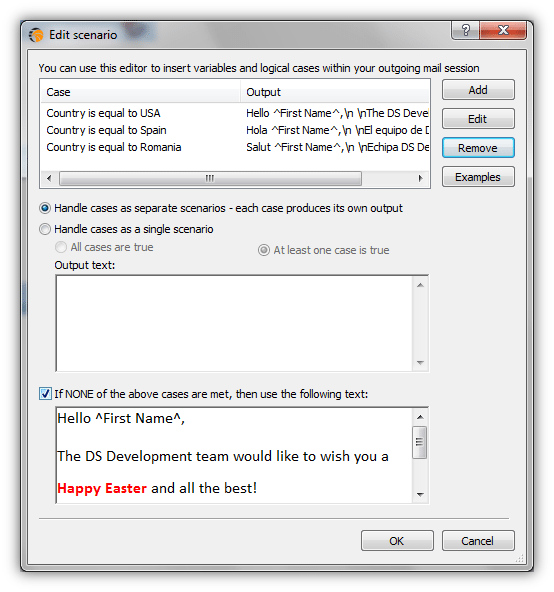 – you can insert imported fields in your email and they will automatically get replaces with the corresponding values, when the Outlook emails are generated. 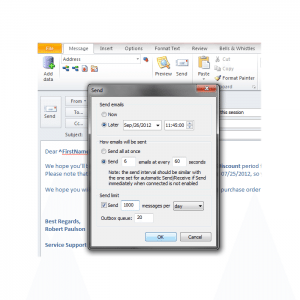 For example, if you want to start the mass email with the name of each recipient, you can simply place your type cursor where you want the name to be inserted and then you select the Name field from the Easy Mail Merge menu and insert it. – you can create complex customization scenarios, using the Scenario Editor. For example, you can define a cross-selling scenario so one email will automatically include a special offer on “Product A” if the related mailing list record belongs to a customer of “Product B” and so on. Once you are done composing your mass email, you can use the Preview function to see how each actual email will look like, when the text variables are replaced with their field values. – specify when you start your Outlook mass email campaign (now or schedule for later). Easy Mail Merge can also handle the mailing list unsubscribe part, so people that choose to unsubscribe from your newsletter are automatically erased from your campaign. 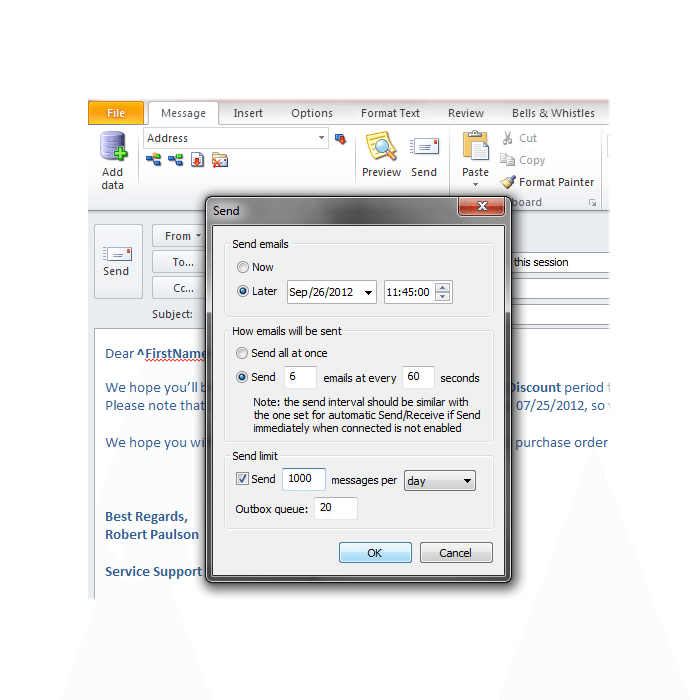 It also features a campaign manager that allows you to view, edit, pause or resume Outlook mass email campaigns. If you aren’t sure about the huge differences between Easy Mail Merge and the Outlook built-in mass email (mail merge) engine, please check this Outlook mail merge comparison chart.